Shangqing River Scenic Spot, located in the northeastern part of Taining County, about 190 kilometres away from Sanming City. Far away from the hustle and bustle of the city, travelling in Shangqing River Scenic Spot will be a wonderful experience that you will never forget. The air is fresh and the river is clean. 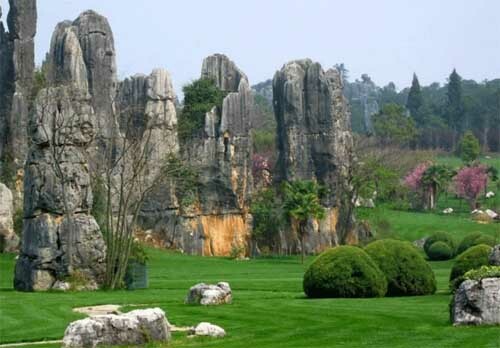 Therefore, when you travelling in Taining, visiting Shangqing River Scenic Spot is a must. As the upper reaches of Dajin Lake (one of the famous scenic spots in Taining ), Shangqing River is more than 50 kilometres long zigzagging along with the complex terrain and enjoys a reputation of the First Drifting of East China. Its widest place is less than 20 metres and the narrowest place can only allow two rafts passing at a time. When you arrive at the scenic spot, the first thing is to ride on a raft and begin your expenditure on this amazing land. The whole rafting will take about 2 hours. Under the excellent skills of the boatmen, you can experience the joy and excitement that rafting brings to you. On the both sides of the river, there are high mountains and steep cliffs covered with thick forest. Sitting on the raft, you can feast your eyes on the wonderful Danxia landform, the magnificent view of the various valleys, and striking peaks. Through the erosion and weathering, the rocks are of various shapes. That is really a superb craftsmanship of nature power. When it is raining, you can have a different feeling during rafting. As there are steep cliffs on the both sides, the rainwater will run down the cliffs and form waterfalls. Then you should be careful with your cameras. Besides, on the far side of the valley, you may find a mystery of Oriental China ---- Cliff Coffin. Cliff Coffin is one of the ways for the southern national minority to bury death in the ancient time. They put the coffin of more than 100 kilograms on the steep cliff so as to well preserve the body. Until now no one know how they could do that. 1) Take coach to Taining County at Hubinnan Bus Station→then take bus to Shangqing River Scenic Spot from Tainning County. Renting a van packaged with driver is the next best alternative. Call Apple Travel to organize a group tour. If you’ve a small group, The ideal number in the group is 5 or 6.